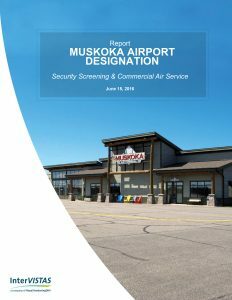 InterVISTAS examined the potential to obtain security screening at Muskoka Regional Airport with the eventual end objective to be able to introduce commercial air service into the airport. 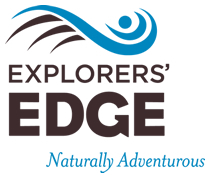 The District of Muskoka, Explorers’ Edge and the Town of Gravenhurst have sought guidance in determining the possibility for the airport to have scheduled services by summer 2017. This report provides the context for security screening, an overview of consultations, the costs to obtain screening, the benefits of having scheduled services, and an implementation plan. Through a series of stakeholder consultations held in the region, media coverage, and surveys, the community has indicated a high level of support for obtaining scheduled air service to the Muskoka region through the airport. Stakeholders saw benefits including increasing benefits to the local economy as well as increasing transportation options for residents. While support was resoundingly positive, support was qualified with the need for companion services (e.g., taxis, rental cars) were available, potential need for an east-west runway, and overall costs were commensurate with benefits. What is the best option for facilities to do this in the short term? Four facility options were examined for the airport including building a new terminal to meet the requirements or using existing facilities with some modifications. The overall recommendation is to build a new, larger permanent structure over the long-term. This option will require time for planning, design, and obtaining requisite funding. To initiate air services for summer 2017, a temporary facility may be needed in advance of an expanded terminal building. In terms of operating costs, CATSA cost recovery is estimated to be approximately $165,000 in the initial year and under $100,000 in subsequent years. The ongoing costs of Class 3 airport requirements are not expected to be less than $8,000 per year. For Year 1, however, $38,000 should be budgeted to help establish aerodrome regulated processes at Muskoka Airport. Therefore, operating costs are approximately $200,000 in the first year and $100,000 thereafter. In terms of capital costs for construction, the total should not exceed $1.5 million under either of two scenarios. A new building is estimated at $922,000 to $1.2 million. Sharing existing facilities with some new construction is $668,000 to $872,000 in cost. Significant cost mitigation could result if temporary portable facilities are used, costing for a standard trailer is between $65,000-$100,000, including transportation and site preparation. Purpose-built airport temporary facilities would be in the order of $400,000. The quality of the client experience would need to be factored into deciding use of temporary structures vs a permanent build, or use of existing tenant facilities. Additional costs may be incurred in terms of marketing commercial flights; determination of these costs is outside the scope of this report. Does the expected economic impact justify those costs? Yes, the economic impact analysis of the expected benefits against the costs indicates that screening services should be sought in order to establish air service at the airport. Depending on the scenario, the net benefit varies. At the minimum, the investment is expected to break even for the amount of capital and operating costs required versus the incremental economic output and GDP creation that is anticipated. On the up side, there could be 3 to 5 times greater benefits than costs, in addition to the corresponding catalytic economic impacts.